The Trump administration expects to confront Russia for supplying the Taliban with weapons and strategic support to undermine the American-led coalition in Afghanistan, senior military officials said Monday. Defense Secretary James Mattis said during a news conference in Kabul that the United States will "engage with Russia diplomatically" where possible, but hinted that action to challenge Russia may be necessary. "We're going to have to confront Russia where what they're doing is contrary to international law or denying the sovereignty of other countries," Mattis said. "For example, any weapons being funneled here from a foreign country would be a violation of international law." Army Gen. John Nicholson, the top American commander in Afghanistan, stood beside Mattis as he confirmed Russia's material support for the Taliban. Nicholson declined to provide specifics of Moscow's role in the country. A senior military official told reporters earlier in the day that the Kremlin was supplying the Taliban with machine guns and other "medium-weight weapons," the Associated Press reported. The Taliban are using the weapons against American-backed troops in the southern provinces of Helmand, Kandahar, and Uruzgan, according to the official. Nicholson told the Senate Armed Services Committee in February that Russia had begun playing a "significant" role in Afghanistan, in part to "legitimize" the Taliban and undermine the U.S. and NATO mission to stabilize the region. Army Gen. Curtis Scaparrotti, the top U.S. general in Europe, voiced similar concerns during a hearing in March. The Russian Foreign Ministry in March rejected charges that Russia was providing weapons to the Taliban, saying its operations in Afghanistan were aimed at fighting the Islamic State. The Kremlin claims that the Taliban is fighting ISIS while the Afghan government remains idle, a narrative Nicholson has dismissed as false. Mattis met with Afghan President Ashraf Ghani on Monday during the unannounced trip to Kabul. 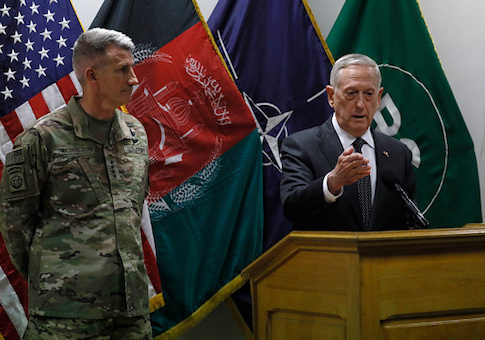 Mattis arrived just hours after Afghanistan's defense minister and army chief resigned following an attack against Afghan military forces on Friday that killed more than 140 Afghan troops. The Taliban claimed responsibility for the attack, which was carried out by several gunman and suicide bombers dressed in army uniforms. Mattis said 2017 would be "another tough year" for Afghan forces fighting the militant group. The special inspector general for Afghanistan reconstruction published a report in January finding the Afghan government lost control or influence of 15 percent of its territory between Nov. 2015 and Nov. 2016. With nearly 12,500 American and NATO forces on the ground in the country, Nicholson told Congress in February he needed a "few thousand" more troops to train, advise, and assist Afghan forces. This entry was posted in National Security and tagged Afghanistan, James Mattis, Russia. Bookmark the permalink.